A global shortage of organs from children and adults available for transplantation is compounded by the failure of next of kin to consent for organs to be donated after death. Non-modifiable and modifiable factors influence decision-making in this area. Modifiable factors are of interest when examining families’ decision-making about the donation of organs from their deceased child. 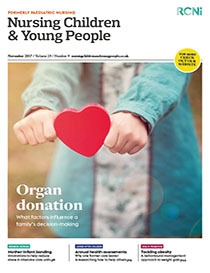 A scoping review was undertaken to determine how modifiable factors influence parental decision-making about organ donation. Thematic analysis identified two themes: interactions with healthcare professionals and pre-disposition to organ donation. Satisfaction with experiences of hospital care, the information provided and the way it was communicated, as well as interactions pertaining to emotional support were all found to be modifiable factors that influenced decision making. Likewise, a predisposition to organ donation and knowing the deceased’s wishes were associated with the consent decision. Nurses working in critical care environments need to be able to support parents during this difficult time. This article aims to raise awareness of modifiable factors that influence parental decision-making, highlighting their relevance for children’s nursing practice.